Need the mowing power of a full-size tractor and the maneuverability of a ZTR? eXmark’s newly updated Laser Z Diesel offers Yanmar diesel power and a new winged 96-inch deck that can fold up to fit in a space intended for a 72-inch mower. An 8-foot cutting width is notable on its own, but eXmark has made the most of this winged design to get improved cutting performance. The deck is built around a 48-inch center section with two blades flanked by a pair of 24-inch wings, each with its own blade. These wings fold up for storage, giving the mower the same overall width as a mower with a 72-inch deck so it can be loaded onto most trailers. When deployed, the wings can flex as much as 20 degrees upward and 15 degrees downward, helping the blades follow the turf with minimal scalping. By eXmark’s estimates, this mower can cover up to 10 acres per hour. The Laser Z Diesel is also available with a regular UltraCut deck in 60 and 72-inch widths with either side or rear discharge. All decks are build using a 10 gauge top plate and 7 gauge reinforced spindle mounts. The spindles are sealed and require no greasing, a feature only available from eXmark. Deck height can be adjusted from the operator’s position at a range of 1-5.5 inches in ¼ inch increments. A hydraulic lift comes standard on all decks. These are the first eXmark models powered by Yanmar engines, chosen for their reliability and high output. Buyers can choose from a 25 hp 1.3-liter turbocharged engine or a 37 hp 1.6 liter naturally aspirated engine. Yanmar’s RED technology helps these engines meet the EPA’s Tier 4 emissions requirements. It also has performance profiles to fit different operating conditions. These modes can be selected from the operator’s position as needed. The engine drives a Kanzaki KPS-18T transmission paired with two Hydro-Gear HGM-H wheel motors. Top speed is 11 mph with the 1.3 liter and 12.5 mph with the 1.6-liter engine. To fit these new engines, eXmark redesigned the rear half of the mower to lower the mounting points for the engine and radiator. This lowers the center of gravity, improving stability and traction. The seat base and footrest are isolated both horizontally and vertically from the mower frame. The operator’s seat is mounted on eXmark’s scissor link ball bearing suspension. It’s covered in vibration-absorbing stretch fabric base help further tame vibrations. A pair of tanks flanking the operator holds a total of 12 gallons of fuel. 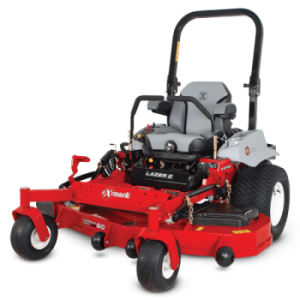 With a few add-ons, these mowers can be set up for a variety of mowing tasks. A rearguard and bumper can be added to protect the engine from impacts when working in tight spaces. Lighting and flasher kits are available to increase the visibility of the mower and allow use in low light conditions. When it’s bright out, a sunshade can be mounted to the ROPS to shield the operator. The Micro-Mulch system seals the mowing chamber for increased vacuum and uses high lift blades to finely chop clippings. A foot-operated discharge control can be added to easily switch between mulching and side discharge. The UltraVac bagging kit uses a PTO impeller to pull clippings from the deck to maintain cutting performance. For sports fields, the turf striping kit rolls blades of grass after cutting, giving turf a fine finish. Shank’s Lawn Equipment is more than just an eXmark dealer: we have over three decades of experience helping professional landscapers and groundskeepers. If you’re looking to buy a mower or you need your eXmark equipment repaired, visit our shop, located at 4900 Molly Pitcher Highway in Chambersburg, PA. That’s just outside of Marion. Need parts or accessories for your eXmark? Visit our website, www.shankslawn.com. We can ship anything you need to any address in the U.S. or Canada. This entry was posted in Uncategorized and tagged Exmark Lazer Z Diesel, Exmark Mowers, Shanks Lawn Equipment. Bookmark the permalink.